There’s nothing like hanging out in the backyard on a warm day, getting a little yard work done and drinking a few beers while you smell some delicious meats cooking in the smoker. I’ve spent many spring and summer days smoking chicken wings and like to think I’ve perfected my recipe. I just have a little electric smoker, but it gets the job done! Someday I’ll splurge on a Big Green Egg…. One of the secrets to great smoked wings is to get the skin really dry before applying the rub. This ensures that the wings have crispy skin instead of rubbery. To ensure my smoked chicken wings have crispy skin I like to place them on a baking sheet, skin side up, and pat them really dry with paper towels. Then I place them uncovered in the refrigerator for a few hours to really dehydrate the skin. 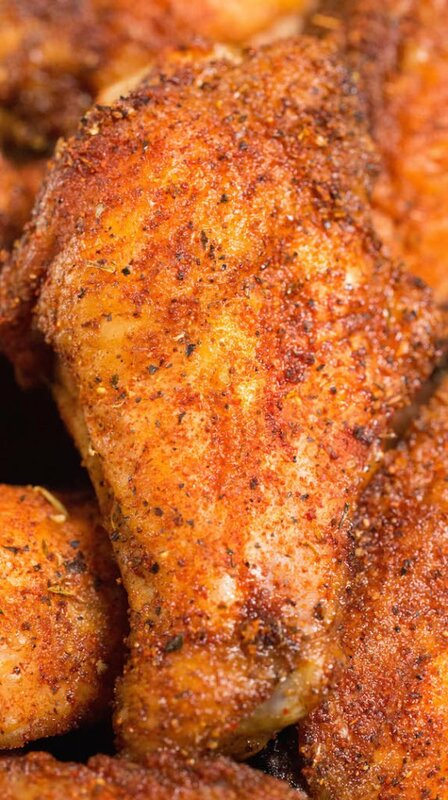 My smoked chicken wing rub is spicy and herby, with hints of garlic and sugar. In a small bowl, I mix paprika, salt, black pepper, garlic powder, oregano, cayenne pepper, and brown sugar. Then, I take the chicken wings and simply rub the spice mix all over. What wood to smoke chicken wings? For these smoked wings, I like to use a mixture of apple, cherry and mesquite wood chips. My mixture is about 75% Apple/Cherry and 25% mesquite. What Temp To Smoke Chicken Wings? I try to maintain a temperature of 220°F and smoke the wings for 1.5-2 hours. As soon as they hit 165° internally, they’re ready to serve! 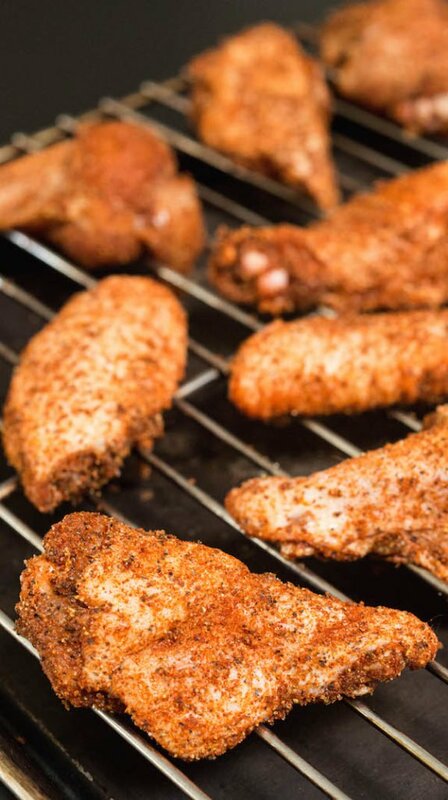 Place chicken wings on a large baking sheet. Pat skin dry really well with paper towels. Place in refrigerator uncovered for 2 – 3 hours. Add all the spices to bowl and mix well. Make sure any clumps are broken up and mixed in. 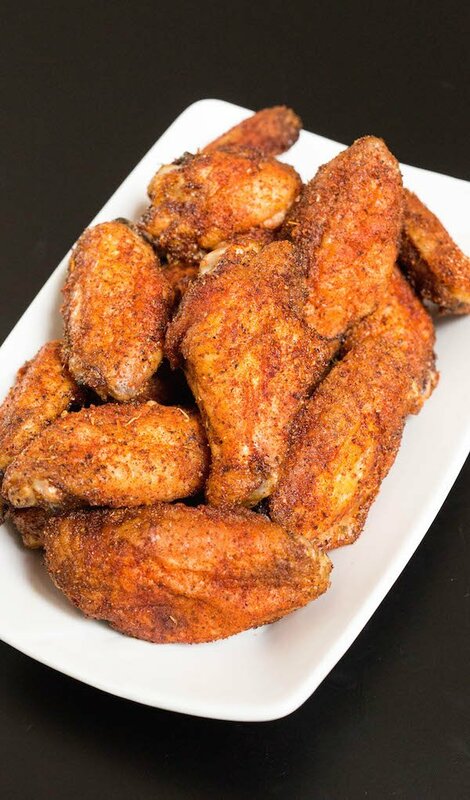 When chicken wings are finished refrigerating, toss in the seasoning and rub in all over. 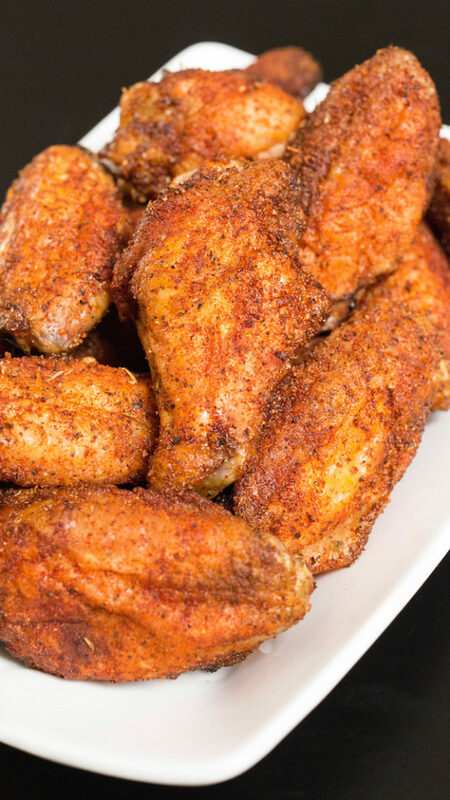 Preheat your smoker to 220° F. Once you have maintained that temperature for about 20 minutes, place the chicken wings directly on the racks in your smoker. Smoke for 1.5-2 hours, until wings reach an internal temperature of 165° F.